Buy It Used. I am a huge supporter of thrift shopping throughout the year...but especially Halloween costumes! They are typically worn so little that there's truly no need to buy brand new every year! Children's consignment stores, Goodwill or other local thrift stores are a great place to look, as are yard sales! This year we found a Disney Store Cinderella costume for our little princess for just $4!! Thift stores can also be a great place to find vintage selections for a retro costume as well! Nothing says 80s rockstar like actual 80s clothing! Do It Yourself. If you're crafty, you truly can go all out for much less money...but you don't have to be crafty to create fun DIY costumes. One of my favorite costumes as a child was a bunch of grapes! I dressed entirely in purple and pinned purple balloons all over! It was incredibly cheap and easy...and I won a costume contest from it too!! Watch For Clearance. Shopping after the holidays is a great way to stock up on costumes for both future Halloweens and dress up boxes...but it's not just after Halloween clearances to look out for. Look for clothing pieces or even toys that might do the job. For my son's costume this year we found cardboard Minecraft heads on clearance for just $3.50!! Check Dollar Stores. Check your local Dollar Generals, 99 Cent Store or Dollar Tree. While they may not have full costumes, they tend to have some pieces that you can put together for a fun look...police badges, pirate patches, etc!! It doesn't have to be super fancy or super expensive for your kiddo to have a great night! Reuse Them! Okay, I know that many kids don't want to wear the same costume over and over again, but sometimes you have to do what you can! In my household growing up there were 3 girls, close in age. We would put all of our previous costumes in a big tub and over the years we could mix and match those pieces to create something fun and new! I always loved having so many options to choose from year after year! Some years we'd add to it, others we wouldn't but there was always plenty to choose from. 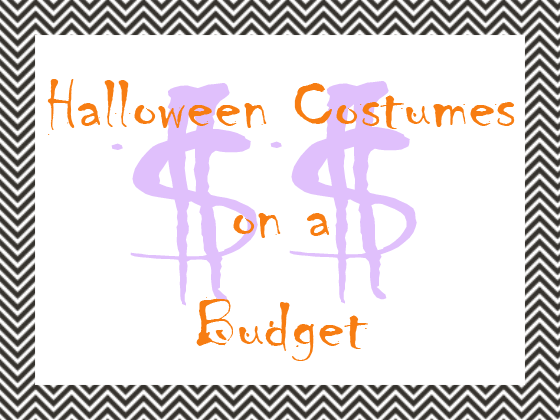 How do YOU save money on Halloween costumes? I like to try and buy on clearance but sometimes it's hard to find something left over at Walmart/Target. Consignment stores are another great option. Great tips! Great tips. I try to watch for sales after Halloween so I can stock up on tons of them for very cheap and use the next year.